Niagara Falls, Ontario - There was “wind coming from every which way,” mist so powerful it clouded his vision and an unfamiliar wire beneath him, but daredevil Nik Wallenda didn’t let that stop him from becoming the first person to walk on a tightrope across the Niagara Falls. He took steady, measured steps Friday night for 1,800 feet on a wire across the widest part of the gorge of the roaring falls separating the U.S. and Canada, accomplishing what he said was his childhood dream - albeit wearing a tether. “I feel like I’m on cloud nine right now,” an exuberant Wallenda told reporters after his feat, which he performed before an estimated 112,000 people crowding the shores of both countries and millions more who watched a live television broadcast. “I hope what I do and what I just did inspires people around the world to reach for the skies,” he said. The seventh-generation member of the famed Flying Wallendas had long dreamed of pulling off the stunt, never before attempted. Other daredevils have wire-walked over the Niagara River but farther downstream and not since 1896. “This is what dreams are made of, people,” said Wallenda, who wore a microphone for the broadcast, shortly after he stepped off from a platform on the American shore. Along the way, he calmly prayed aloud. Toward the end, as he neared the Canadian shore, Wallenda dropped to one knee and pumped his fist while the spectators cheered. He broke into a playful run about 15 feet from the finish line, where his wife and three children waited. ABC televised the walk and insisted Wallenda use a tether to keep him from falling in the river. Wallenda said he agreed because he wasn’t willing to lose the chance to perform the walk it took him well over a year to win permission from two countries to do. Such stunts are normally illegal. ABC’s sponsorship helped offset some of the $1.3 million cost of the spectacle. Wallenda said he thought about the tether, which was secured at his waist and dragged behind him, at several points along the 30-minute walk but wasn’t hindered by it as he’d feared. 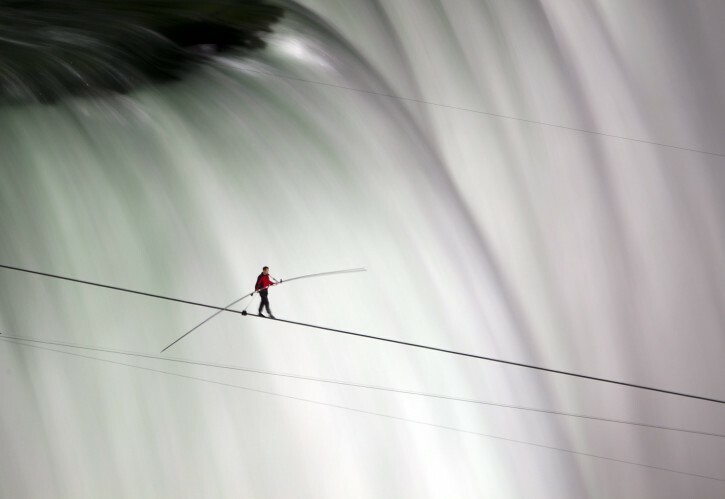 For Wallenda, who has grown up on the high wire and holds six Guinness records for various stunts, the Niagara Falls walk was unlike anything he’d ever done. Because it was over water, the 2-inch wire didn’t have the usual stabilizer cables to keep it from swinging. Pendulum anchors were designed to keep it from twisting under the elkskin-soled shoes designed by his mother. The Wallendas trace their roots to 1780 Austria-Hungary, when ancestors traveled as a band of acrobats, aerialists, jugglers, animal trainers and trapeze artists. The clan has been touched by tragedy, notably in 1978 when patriarch Karl Wallenda, Nik’s great-grandfather, fell to his death during a stunt in Puerto Rico. About a dozen other tightrope artists have crossed the Niagara Gorge downstream, dating to Jean Francois Gravelet, aka The Great Blondin, in 1859. But no one had walked directly over the falls, and authorities hadn’t allowed any tightrope acts in the area since 1896. It took Wallenda two years to persuade U.S. and Canadian authorities to allow it, and many civic leaders hoped to use the publicity to jumpstart the region’s struggling economy, particularly on the U.S. side of the falls. A fine young man who accomplished an amazing feat! so the meshuganah would have gone for a little swim if he fell off. #1 never said the guy was wonderful. It was an amazing feat as it was never done before, it was wonderous and he was successful. Why dont you just lighten up. Well he didn't, so he hasn't. it's amazing what the human body can actually do! I look at this guy stupid! He put his life in danger for fame!!! Crazy is my opinion, not wow! !